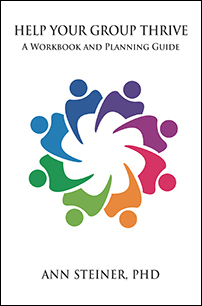 This easy-to-use manual is recommended for leaders of all types of groups – discussion groups, peer support, organizations, and workplace teams. You’ll find discussion of the different types of groups, leadership styles and roles. Worksheets help you figure out your preferred leadership style, along with facilitation tools, sample group agreements, online netiquette information, and numerous modifiable written forms for starting and maintaining effective groups. 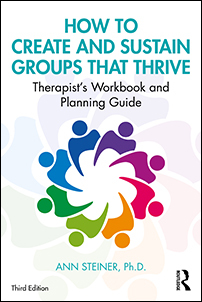 Practical advice and templates help you design your group, select potential members, and understand common group challenges. These valuable tools will take you from defining your group’s mission to helping your group thrive. Dr. Steiner provides a hands-on approach to the challenges of forming and maintaining cohesive, durable and effective groups. This easy-to-use manual includes a screening and preparation system, complete with modifiable forms. Each form is designed as a guide that you can modify for your groups. Call or email for quotes on quantity discounts. "The Therapist's Professional Will™: Guidelines for Managing Planned and Unplanned Absence "
Description: This downloadable program provides therapists with easy to follow worksheets, templates and tips that prepare you to create a professional will. This crucial document helps you specify your wishes for the continuing care of your patients when you are out of the office due to vacation, unexpected emergencies or illness causing absence, or termination of the practice. By completing this vital document, and making sure that it is compatible with your personal estate planning documents, you can rest assured you have done your very best to ensure the continuity of care and are adhering to your professional guild's ethics requirements. For more information, consultation, or to ask about group or quantity discounts, feel free to call (925) 962-0060. ONLINE VIDEO COURSE FOR LAW AND ETHICS CEU CREDIT! Course Description: Illnesses and other sudden emergencies happen. Now is the time to plan for expected and unexpected absences. Dr. Ann Steiner teaches participants how to minimize the impact on their patients, colleagues, families and themselves. She is joined during the final hour of this course by A. Steven Frankel PhD, JD, ABPP discussing specific legal aspects related to the Therapist's Professional Will. The Therapist's Professional Will Course meets the criteria for 6 hours of Law and Ethics Continuing Education for Mental Health Professionals, Counselors, MFTs, Psychologists and Social Workers. Add $10 for 6 Continuing Education (CEU) Law and Ethics credits for this course. This course is offered through the Steve Frankel Group's Online Continuing Education series in three convenient formats: online, MP3 and CD, and is available with or without CE credits. "The Therapist's Professional Will™: Audio Introduction"
Description: This MP3 provides therapists with an introduction and overview of the benefits and key features of Dr. Steiner’s comprehensive Therapist’s Professional Will™ Guide. Call or contact us via email for quotes on quantity discounts. 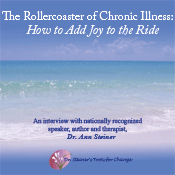 How to Add Joy to the Ride"
Description: MP3 or Audio CD: An interview with motivational speaker and psychotherapist Dr. Ann Steiner. CD inclues Shipping and Handling of $3.28 and sales tax of 9.25% for California residents. Allow 2-3 weeks for delivery. For orders outside of the U.S., please email us for shipping costs. Call or contact us for quotes on quantitydiscounts. DISCLAIMERS: This site is designed for educational purposes and does not accept or host any advertising. Dr. Steiner is solely responsible for the editorial content. Information provided on this site is meant to complement and not replace any advice or information from a health professional.